It is easy to categorize history, to view it as something long past and part of another era long dead and forgotten. Even current events quickly fade from view and we remain unaffected except for the momentary sense of wonder or outrage and our lives left untouched in spite of the anguish. The media promotes and even encourages that, it is our defense from hardship, viewed from the comforts of home with the flat screen television transforming our living rooms into theaters. The wilderness offers a fresh perspective. There are canyons within canyons there, insulated from the outside world and hidden from view unless you are either very adventurous or tasked with a job to go there. My case was the latter and my job entailed I travel to the depths of the San Agustin Plains to monitor the water levels of a network of wells. Over time I began to pick and choose the order by which I measured them so as to optimize my efforts as well as my enjoyment, I saved this one for last. The Christmas Canyon Well sits deep into a canyon which can only be reached by passing through several locked gates and a winding dirt track through the mountains which overlook the Monticello Box Canyon in southwest New Mexico. The road leaves the gravel track at the first locked gate and follows the more passable slopes of canyons and hills before it dwindles to a faded two track up and over a rocky slope, pebbled with agates and rhyolite. The final half mile is behind a gate for which I no longer had the key, so I walked from there, my steel tape in one hand and my tool bag in the other. The climb is steep, but the many hikes my job required had long since restored the strength to my legs allowing me to take pleasure in the effort. Knowing the trails, I cut across over the hill rather than following the road, I have learned all the shortcuts. Cresting the slope I walked down to the well, an old windmill whose fan had been lifted by the wind and deposited back on top of the tower, torn and useless. I always wonder at the gust which allowed it to do that, it should have hit the ground. I measured the well quickly, having learned its tricks, and recorded my readings in my journal. The season being late summer, the morning was still cool, and the unexplored hilltops to the west beckoned me to come forth. I chose to follow their call. The mountainsides above the canyons are steep and rough, peppered with volcanic rocks and outcrops, steep and challenging, treed with cactus and all manner of thorny plants, forbidding at best. A slip equates to a fall and there is no room for mistakes. I carried only my water and my camera and I was glad my calves were wrapped with leather chaps which protected them from snakes and stones both, a necessary piece of equipment for one such as I who never shirks adventure. I climbed quickly but cautiously, occasionally taking pause to capture my breath and the view, both of the utmost importance. The steep slope carried me quickly to a higher elevation and the vista expanded as I climbed. I was surrounded by Plains and mountains and the elevation changed the perspective as the length of the canyon spread further and further into the distance. The thrill increased in equal proportions as I have driven the length of the canyon also, all sixteen miles of it, and was familiar enough with the terrain to recognize the outcrops below me. When I reached the peak the view was spectacular and looking to the west I imagined the distance to the Gila Wilderness which covers the ground all the way to Arizona. To the south I crossed the border to Mexico and to the east I looked towards home, far enough I might say. To the north one can imagine the haze of smog which lingers over the city of Albuquerque, where in spite of the arid climate and the open spaces beyond it the mountains still trap the air. I might have been satisfied if I hadn’t known the country so well, but as I looked towards the next hilltop, higher than the rest and overlooking the depth of the canyon, I accepted the challenge. I was too close to do otherwise in spite of the rugged terrain. The hilltops here are nothing more than rugged hogbacks where the lava rock pushed high above the flats to form ridges of ragged stone which make every step an effort. I also knew this was a one shot deal, in essence I was trespassing and though I might beg for forgiveness I might never gain permission. My job gave me license to the well, not the kingdom, but I ventured forth in spite of that, a rare exception I might add. The final climb made my breath ragged and I took care not to stumble or fall as either would be painful. I crested the peak and might have stopped except that there was one final outcrop of rock to be reached and it offered a small sitting place, so I climbed the final stretch. From there the hillside tipped precariously to the canyon below, nearly perpendicular but accessible all the same, the row of ancient fence posts bearing testimony to that. At the crest of the ridge stood one of the same, so old as to appear petrified, dark brown and weathered and still adorned with strands of ancient barbed wire. Tied to the wire dangled a horse shoe, as old as the post and the wire, hand forged and worn thin at the toe, well used and rusted, pitted by the years it had hung there. I sat, the ponderance of such things requires complete stillness and it was afforded to me in complete measure. What hand had hung that shoe? How old was he when he came here and left that monument to himself? Was he a young and handsome cowboy with some deep insight into the future or had it been on a whim. Was he some old weathered cowhand who squinted at the sun and thought to himself it would be there for another hundred years to remind someone he had been there? I could hear the jingle of his spurs as he stepped upon the stone where I now sat and twisted that wire around the narrow toe of the shoe so as to secure it for the centuries to come. He didn’t look at it very long and he likely forgot all about it before he left. He would have had to nail another one onto the bare hoof it left behind before he rode back out of the canyon as the trail was too rough to do otherwise. He could not afford a sore-footed horse, it was his livelihood and he had to protect it. History dangled on that fence post, over one hundred years remaining from just yesterday and only the rust betrayed its age. 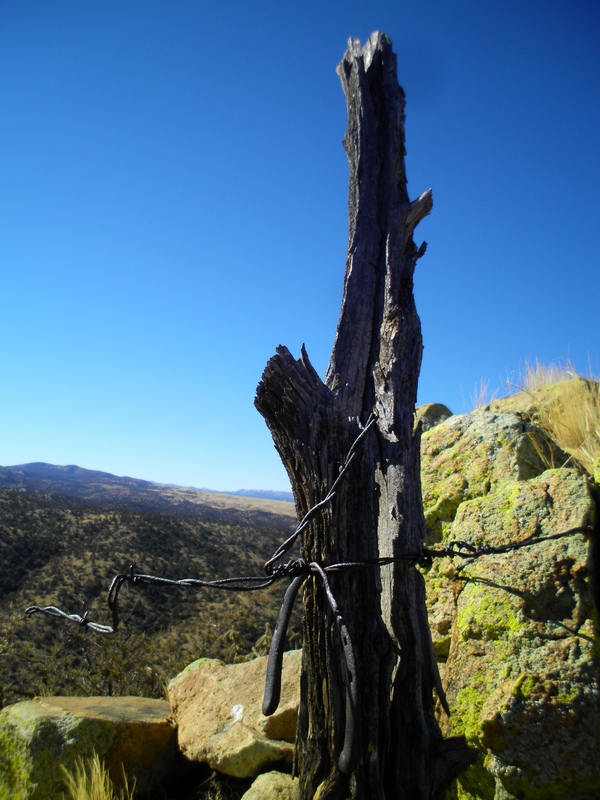 The fence was long fallen but the wire remained and the fence post was still sturdy. Nothing rots here, it is too dry for that and what rainfall there is runs off of the rocks as quickly as it hits, the post was embedded in that rock. I didn’t touch that shoe even though I was tempted to; it was too sacred for that. Instead I took pictures and captured it in words, memorializing it, incorporating it into my history and recording it for future reference. The memory is still fresh even though that was three years and many miles ago. It remains as precious and wonderful as it was the day I discovered it and brought with it a lasting impression of what life was like in that place over a century ago, it still lives there. Even as our society plunges forth into this modern age things remain static in the wilderness, as untouched as the shoe dangling on that post, ageless. It will be the same one hundred years from now, the post will still stand, the wire will still be there and the memories will be the same, there were cowboys and one of them stood there. He tied an old worn out shoe to a fence post and he left, that simple, that poignant. On television the news history flashes before our eyes and quickly disappears. It touches us but just as rapidly fades from view as the next image is displayed on the screen. It distances itself quickly and then it is forgotten. In the wilderness it is different; the signal is lost before it ever gets there. Thank you for your comments and I will look forward to hearing from you again. I appreciate your comments and I will email you to se if there isn’t something we can work on together. I want to share my work as much as I can and I am looking for a broader audience.